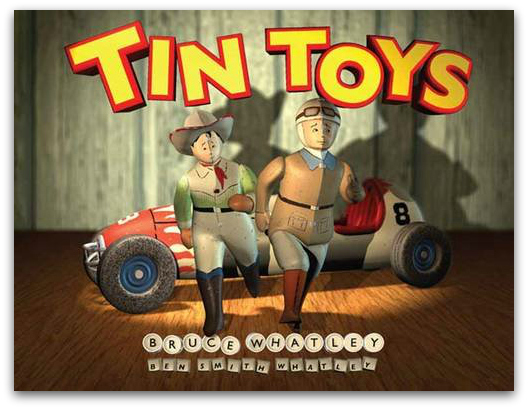 The stunning quality of the illustrations, combined with an old fashioned charm and a very modern sense of humour means that My Book Corner believes Tin Toys will be a perfect one for Christmas, No! too soon a great present! Bruce Whatley’s picture book begins nice and calmly. A few paragraphs on each pagecarefully set the scene. Then the toys spring in to action on a mission to find the key to wind up the old toy – Space Ride. This is when Whatley’s sense of humour also springs in to action! My Book Corner loves the way they portray the toys making their way across to the sleeping shop keeper … very, very carefully! Buster winking made us all giggle – well, he is a tin toy. Genius! There are too many laugh out loud moments to mention here – great elements of dry, subtle humour which is a fantastic bonus for adult readers too. You are going to really enjoy this one. I would love to write a children’s book like this – clever, witty, entertaining and pure fun – brilliant!